In some countries of the world, chocolate chips are sold in teardrop shapes. These would have been perfect for my chocolate chip scones as many tears were shed this past Sunday. 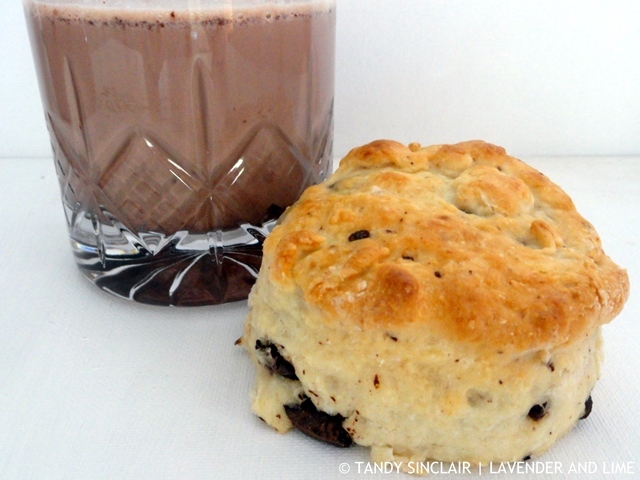 This weekend I had to take comfort in chocolate in the form of these chocolate chip scones. In February 2013 we adopted a Jack Russell rescue dog from our local animal welfare. She had spent the month in the kennels and had not done well in them. I collected her on the 27th from the local Vet where she had been spayed. She was really ill and for the first two days spent the entire time in her basket. Misty got better but suffered terribly from eczema. This led to her being very irritable and our Vet did not want to put her on cortisone. Even though most of the time she was a loving dog, every now and then she would attack our other Jack Russell. Molly is tiny and always came off second best. Eventually we got her onto the cortisone and she was a changed dog. She was friendly and playful and her hair finally started growing back. But she did not stop fighting. Two weeks ago our Boxer was at the sharp end of her teeth and Misty ended up with a huge slash in her neck. Dave and I had discussed our options prior to this with what to do with her. On Sunday morning she attacked Molly. It was so bad that both dogs were pink instead of white. My cottage floor was covered in blood. We were left with no choice but surrender her back to animal welfare. No matter how cruel that sounds it was for the best. I have been living in fear of coming home to find a dead dog. My heart broke as I said goodbye, and I hope someone offers her the home she needs. One where she will be the only dog and treated with love. That is a wonderful, fluffy and golden scone! I read on FB that you have to give her up. Such a shame but you have all of the dog’s best interests at heart. Definitely the scones are a comfort food. Oh, what a difficult decision for you to have to make, Tandy. I would have needed a whole batch of these scones to myself to cope with that. We are at the tail end of the life of both of our dogs and our Irish Wolfhound in particular is having some problems. I know I will have some difficult decisions coming up soon, too. I am so sorry you have been living this terrible feel of your own pets injuring themselves and I know that was a very hard decision to make…but the right one. My heart goes out to you. They may not be all the comfort you need but the scones look marvelous. Such a sad tale Tandy. My friend’s dog went senile and savaged one of her fellow dogs to death. The grief this causes is so intense. You did the best thing. I really hope she gets a loving home. Sally, my heart breaks for your friend. That must have been so awful! Chocolate does make things seem better! Hello Tandy. The scones look stunning! I’m dying to taste one now.. Such a tough decision to have to make, I’m so sorry. Oh Tandy, I am so sorry, we had to do something similar once, it about broke my heart but it was best for our children and other pets at that time. Sending you hugs from the states. Your scones look amazing, they make some very similar to yours at our Wednesday’s farmers market. Thanks for your big hugs Cheri! Oh my these little scones of yours are calling my name. With the drop in temp my body is just craving the carbs… LOL Wishing you a super weekend! Thanks Bobbi, hope you had a good weekend as well! I hope everything will turn out for good and she will find a loving home… The scones look very tasty! Oh Tandy that is very sad indeed but I think you did the right thing. You couldn’t have put Molly’s life in danger. We are looking after a little one and I can’t imagine how I’d feel if anything ever hurt her. It is the worst thing to witness Lorraine! 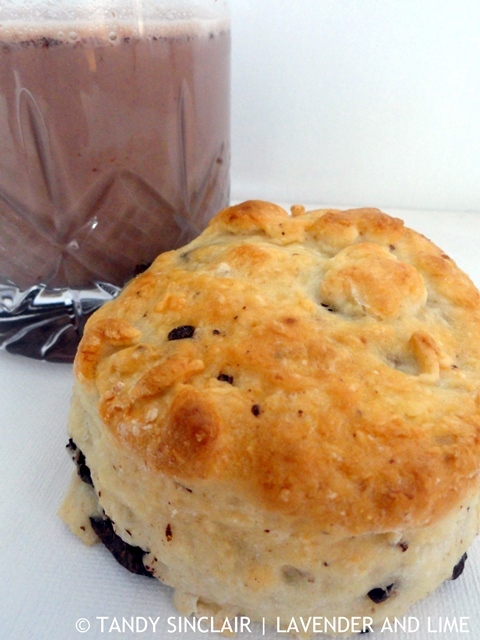 Iv’e never put chocolate with a scone before. Sounds lovely. So sorry to hear about your pup Tandy. How very heart breaking. I always think of Jackson Galaxy (a cat person) who manages to resolve the worlds problems with cats – I know there is a dog person too but can’t think of his name. Hope the pup goes to a loving forever home soon – she must be so scared being back at Welfare. I’m heading into the kitchen to bake 60 cupcakes for a friends 50th birthday party. Yes Mandy, she was very scared. But not as petrified as Molly has been for the past few years. Molly has been cowering and hiding and the threat of Misty killing her, and then Scarlett killing Misty was just too much for me to bear.